Brownie Pecan Pie Ooey Gooey Butter Cake A fudge brownie layer, topped with a pecan pie filling and then a cheesecake layer. Ooey gooey cake at it’s best! I just can’t stop making these cakes and the flavor combinations just get better and better. I know I said last time but this is one is the best one so far! 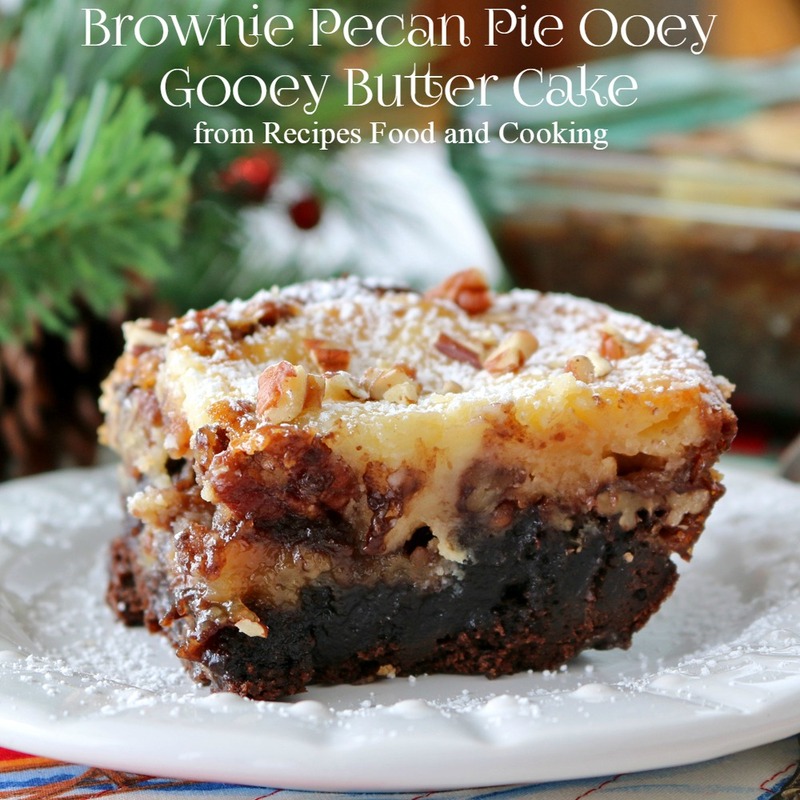 Chocolate and ooey gooey pecans…. that just about covers it! I wish I had thought to weigh this cake before I took pictures because as I was carrying it back into the kitchen I realized that I think this cake must of weighted like 7 lbs! I’m sure it didn’t but this is a lot of cake, trust me. You don’t need a big piece either or for sure you might go into a sugar coma. Regardless, it is so good that you just don’t need to think about it, just grab a fork and dig in. 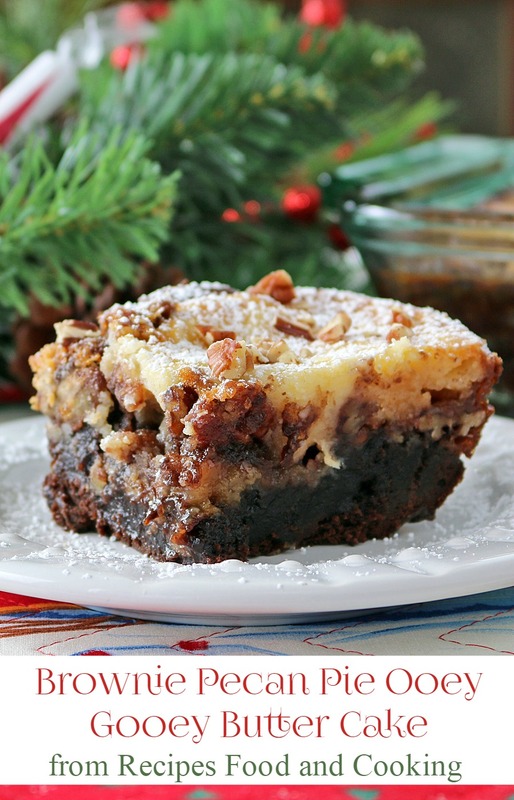 The brownie layer is so fudgey, then you have a layer of pecans with some of the pie filling mixture and topped with a cheesecake topping. You can see in the picture above how I did the cheesecake topping. Just evenly dollop the cheesecake layer on top of the pecan pie filling. The pecan filling will bake into the cheesecake and the brownie layer. Update 12/21/18: Because of the density of these ooey gooey cakes it can sometimes be difficult to tell when they are done. They are done when they reach 210 degrees on a digital thermometer. A tester should pull out clean at this point. 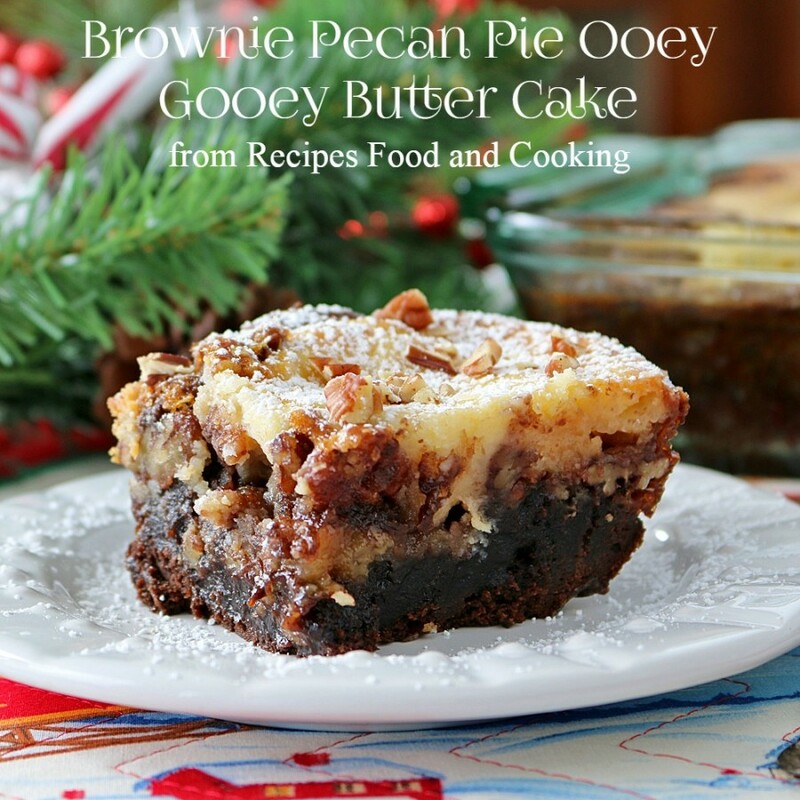 A fudge brownie layer, topped with a pecan pie filling and then a cheesecake layer. 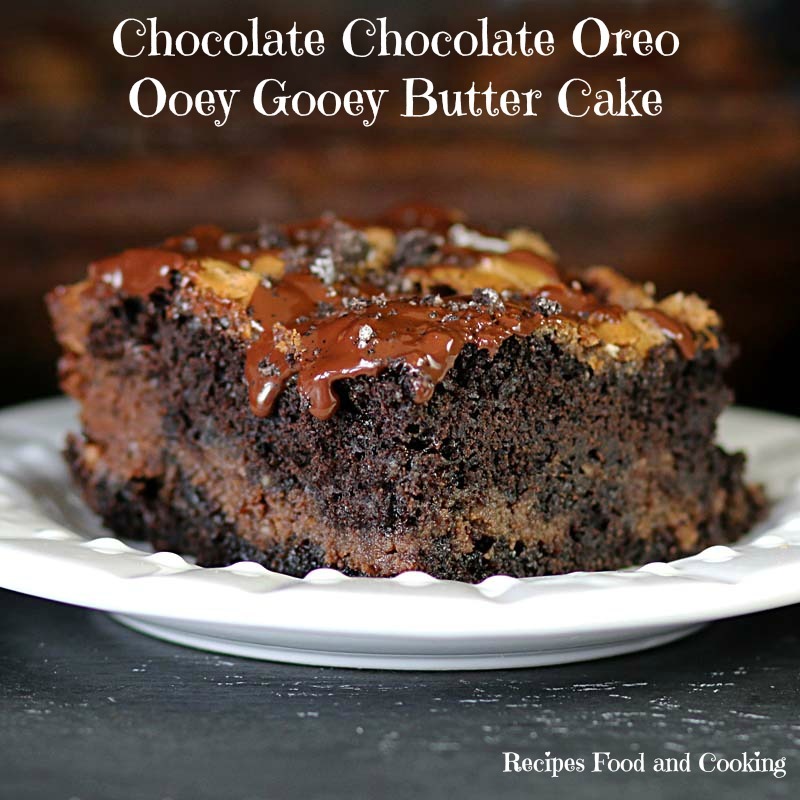 Ooey gooey cake at it's best! Preheat oven to 325 degrees. Spray a 9 x 13 pan. Add all of the base ingredients to a mixing bowl. Mix until it comes together. If some won't mix in add another tablespoon of water. This batter will be really thick.Spread it out on the bottom of the pan. Pat the dough into place. In another mixing bowl add all of the filling ingredients except the pecans. Whisk together until all is blended together. This will take a couple of minutes with a mixer or a whisk. Add the pecans. Stir in. Spread out on top of brownie base, getting the pecans as even as you can. Mix together the cheesecake mixture in a mixing bowl until thoroughly combined. Drop by large tablespoons over pecan filling like shown in the picture above. Carefully put this in the oven. Bake until the center shakes slightly. If you touch down on the cheesecake part it will feel firm. It will just be starting to turn brown. Start checking this at about 50 minutes. Mine took 1 hour and 10 minutes. Want to see our other Ooey Gooey Butter Cakes? The ooey gooey queen strikes again! Fabulous, Mary Ellen! I was scared to see the sugar count so never did it. You know moderation is the key! It’s not like you’re eating it everyday. I do put it in the refrigerator but take it out so it comes to room temperature before serving. This dessert looks amazing. I have never made a ooey gooey butter cake before. I must do it soon. Wait until you do Sarah! and if you adapt to the crockpot, OMG! That is exactly what it is Carrie. I just love chocolate desserts and pecan pie is my favorite pie. So now I’m going to have to make an ooey gooey butter cake which I never made before. But I’m so willing to try, I can’t pass up all this deliciousness. Thanks so much for sharing. I do to, as soon as I thought about it I went in the kitchen and made it immediately. 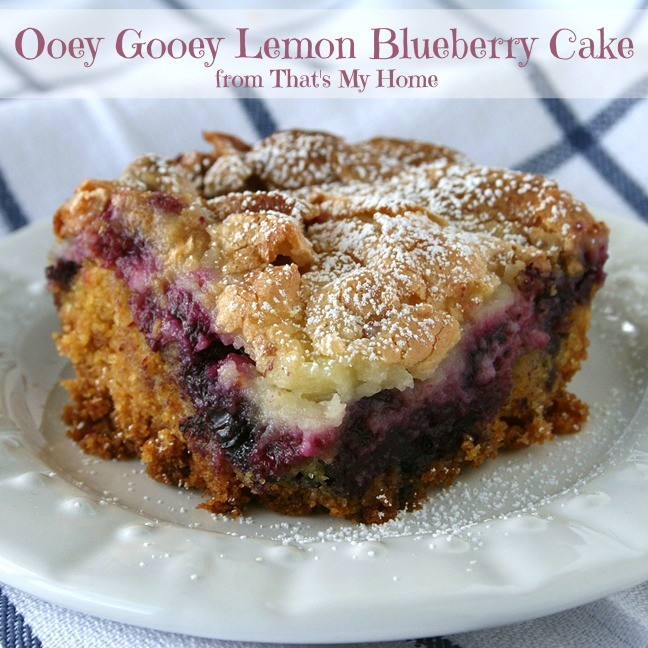 Ooey gooey cakes are easy to make and everyone loves them. Yum I love a good combo dessert! Wow. This looks wonderful. Mary Ellen, you mentioned adapting it for the crock pot. That sounds even better. How would you do that? Thanks, pinning this now and adding you to my list of pinners that I follow. When I have made ooey gooey buttercake before the recipe always says to use a jelly roll size pan. The cake is a lot thinner, do you think it would work with your recipes ?? I don’t think they would work because the depth of these is what makes them so ooey gooey. If you do decide to try it I’d be interested in the results. I worry it is going to over the sides of the pan and make a real mess. Hi. Any thoughts about making these in a cupcake tin with liners? Can’t see why it would not work. These recipes sound WONDERFUL ! ???? Can’t wait to try them ! I made this according to directions, and the brownie mix is not stiff enough. I would suggest leaving out he water, because as it is the pie filling soaks up into the brownie mix. It was not very sweet which I like sweet and decadent. This is SOOOOOOO yummy! My husband and I love to cook together. We made this and OMG! It is a BIG slice of heaven. My husband referred to it as a “fat boy special”. It is NOT a healthy dessert but who cares!!! For a special treat this is AMAZING!!!! Thanks so much! I’m not sure it would adapt well. Let me know if you decide to try it in a slow cooker. This cooked for 50 minutes and the cream cheese topping was browned but the rest was not set up. Put back in for another 15 minutes with foil on top to stop that from burning. Still not set up. Cooked at 325 in a 9×13 aluminum pan. You should of been at 350 I think with an aluminum pan. It sounds like it needed more time. I’ve made this a lot in a couple of different ovens (I just moved) and both baking times were different. In that pan it should of been done by then. That center should puff right up. Well then you should probably change the directions from “bake at 325” to “bake at 350”. Mine also did not setup and the brownie bottom is a wet mess disaster. Might have to throw it out. Seems like the 1/4 cup of water was not needed. I also feel I need to comment about the cream cheese layer. I used a whole box of Confectionery Sugar and it was still VERY RUNNY. Had I thought about it, I would have added more sugar until it was stiff. It was not able to “dollop” on top. It poured. The next time you make this cake, try substituting cold brewed coffee for the water in the brownie portion of the cake. Coffee amps the chocolate taste by several factors! Thanks Janet, it’s about time for a new one. I’ll work on one next week. I wonder Mary Ellen would this work for cup cakes? I’d be afraid of what it might do. Of all of the ooey gooey cakes I’ve made this one is the hardest to get baked correctly because of the pecan pie filling. Can this be made with a scratch brownie recipe? something always tastes off to me with box mixes so i like to bake totally from scratch. thanks! Absolutely it can be. Just make one for a 9 x 13 pan. Please update recipe instructions. If you add the 1/4 cup of water to the base as the instructions tell you to do it is very runny. Hi Misty, I used the 1/4 cup of water and it was fine. Is there a pecan pie filling out there to buy already made? Or do I make it from scratch? You make it as the recipe says. I don’t know of a filling you can buy already made. I am sure there is in specialty stores but I made it for this recipe. Any recommendation on storage of this dessert? I presume it should be refrigerated because of the cream cheese? It should be but if you made it for today I would leave it out until serving. It is better at room temperature. I am trying this recipe today! It is currently baking and I hope all turns out well! Brownie layer looked great, pecan pipie layer looked nice (even though I had a mishap with the vanilla :)), but I’m not sure about the cheesecake layer. Mine was very soupy. I could have easily poured it over the rest. 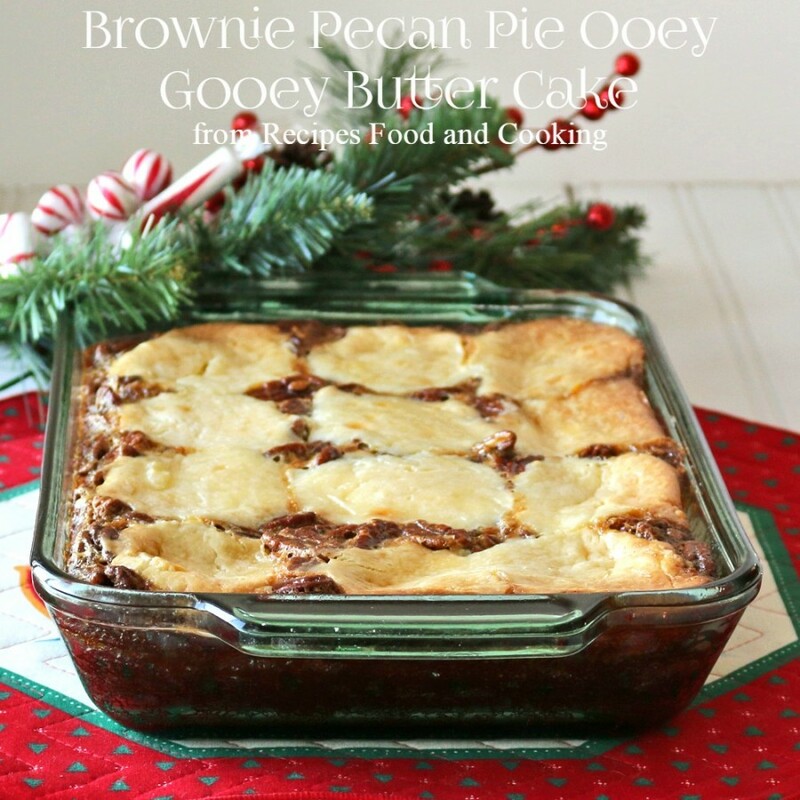 There was no pecan pie layer peeking through like the picture. I hope it’s all good! Thanks for the recipe! My boyfriend loves pecan pie filling but THATS IT! He scrapes the filling out of the pie and its it solely. I on the other hand am O-B-S-E-S-S-E-D with fudge brownies so you can imagine the burst of excitement that took over me when I found this recipe! Oh and did I mention he asks me for it EVERY Sunday! Sweet job! I made this for my sister’s birthday and it was awesome! I followed the recipe exactly and it turned out perfect! Decadently sweet. I sprinkled mini chocolate chips and chopped pecans to top as soon as it came out of oven. I have a request to make three more of these for another birthday party!! would love you to try something with coffee flavor, toffee hunks, chocolate, . . . I know you can do it ! ! ! YUM ! Can you make ahead and freeze ? If not, how long does it keep in the refrigerator ? Thank you… sounds wonderful!! All my favorites in one! So many of my favorite things in one dessert!! If you add some coconut and chocolate chips to the pecan pie filling part it tastes like German chocolate cake or German chocolate bars….. SO GOOD! Thanks for the recipe. What a great idea! thanks for sharing it!!! Going to make this but can it be frozen? How long can it be stored in the fridge? Thank you for such a good recipe! Made this, it’s very good but yet very rich and sweet. It not a quick desert to make but relaxing if you’re like me and bake to relax. Thank you for sharing. I tried this recipe, but just like what others experience, it went runny. I covered the top with tin foil so it will not burn and add another 15 minutes. Also, the cheesecake did not turn good also runny, so I escape the dollop. Maybe next time I will lessen the confectioners sugar. This cake because of it’s nature has a long baking time. If baking in a pan other than glass I’d bake it at 350. I debated even making this but it sounded very yummy! I tallied the votes and it seems to be about 5 nays and 6 yays….so I made it yesterday for my ladies sewing group. I almost decided to leave out the 1/4 water but changed my mind….made as called for. I did add an extra cup of conf. sugar to the cheesecake part as it was pretty soupy; the extra sugar did not help. I baked it for about 1 hr and 5-10 min. It quit jiggling in the middle so I decided it was done. I cut out a corner for my husband to sample…course it was still warm so it was gooey. The girls and I loved it but it did not turn out like yours. My pecan pie part went to the bottom and the brownie part was a gooey part in the middle that I am almost wondering if it is safe to eat with all those eggs which probably aren’t cooked! But I am eating it! The soupy cheesecake part was not dollapable….and when baked it hard to detect…but it is yummy! I will probably try again. Just don’t understand why there is such a difference in yours and mine! I just finished putting together this cake I’ve made several different kinds of ooey gooey butter cakes… pumpkin, marble, peanut butter Etc. Your cake looked over the top and just what I needed for a dinner get-together. Not realizing that your initial list of ingredients only listed three eggs total and your full recipe shows one egg for the base 3 eggs for the filling and 3 eggs for the topping. I followed the instructions exactly, realizing each step of the way the layers were much more moist and thinner than any other ooey gooey cake I’ve ever made… not to mention that your instructions stated apply cheesecake layer in dollops and my topping could be poured a bit thick but certainly was pouring. I investigated and realize where the error might be. Perhaps you should review your recipe just in case! I think perhaps you meant that there was one egg in each layer as opposed to a total of 7 eggs!!! Waiting for it to finish baking now, I’m guessing it’ll all taste just fine anyway just a little gooier than usual! Wishing you continued happy baking and many blessings. I am assuming you refrigerate this as you would a pecan pie and a cheesecake? yes and take at out and take the chill off before serving for best flavor. Thanks, glad you enjoyed it!!! My cream cheese layer looks very thin compared to your picture. Should the butter be only softened and not melted? I melted it. Was the pan size the same? The two layers kind of combine together in places so it will be thicker in some places than others. I made this Brownie Pecan Pie Ooey Gooey Butter Cake. The cream cheese topping looked like alot of filling, but I did it just like you said. Put it on top just like the picture. When I looked at it in the oven the topping had cover the whole top. I cooked it for an hour because the middle was to jiggly. The whole topping turned a light brown. I don’t know why my top filling covered the whole cake when your’s did’t. Will have to let it cool to see how it taste. This cake does take a lot of baking time, because it is a lot of stuff in the pan. I’m sure it will taste great! If it starts to get to brown I loosely cover it with foil. All ovens bake differently and it will change the appearance. mine may of set up sooner so it didn’t spread. I can tell you this cake has been made 100’s of times if not more and it’s all about how it tastes!